We have officially stepped foot into fall here in the Northwest, and what better way to enjoy a chilly rainy day than with a fresh warm plate of cheesy orange cauliflower? White cauliflower is great for your health, but an orange cauliflower contains about 25% more vitamin A than a white cauliflower. To add to that, garlic boosts immune system and improves circulation. As for the parsley, eat more of this green ingredient because it contains so much iron and promotes a healthy heart. 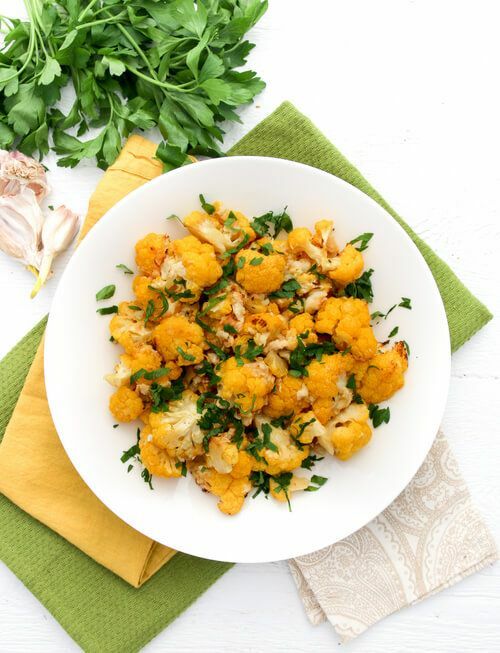 Orange cauliflower is now in season so go try it while you can! Place cauliflower florets into a baking dish. Sprinkle 1/4 cup shredded parmesan on top. Roast cauliflower for 20 minutes. Sprinkle with 1/2 Tablespoon chopped fresh parsley and green onion.